Nobody likes holes in their shirts, ties or scarves. Traditional pins and brooches, be warned: Your days are numbered! In this month’s article, K&J takes a look at how magnetic pins and brooches are made. We’ll cover pros and cons, what magnets work well and how you can make your own. As usual, the topic comes from the many great emails and questions we receive. Have a magnet application you need help with? Email us! 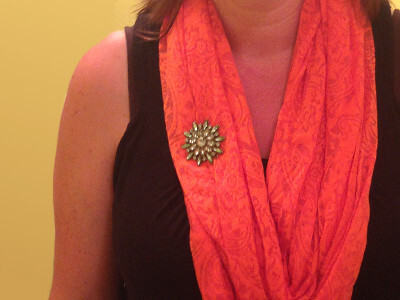 A magnetic brooch used as a scarf "pin." 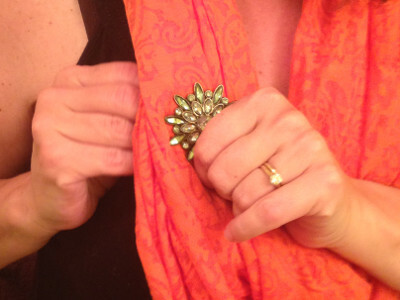 The brooch is attached by placing a magnet behind the scarf. 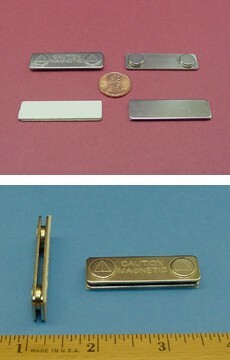 Here D82 magnets are used as a magnetic tie pin. Traditional pins are held onto clothing with a steel pin that sticks through the cloth. Some are like a safety pin, where the pin pokes through the material twice, to latch back at the front. Others have a back-piece, which the pin sticks into. If the fabric is a loose weave, the pin might not harm it at all. If it is a tightly woven material, like a man’s necktie, the pin can leave a visible hole. Repeated use can leave several holes. Magnets can hold a decorative pin in place, but accomplish their hold with magnetic force. 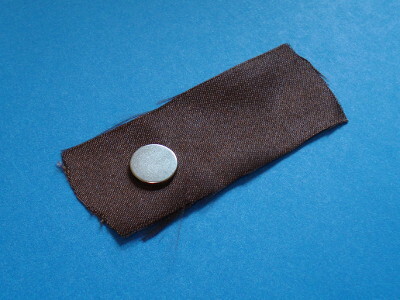 A magnet is placed on either side of the fabric, and their attraction clamps the fabric between them. 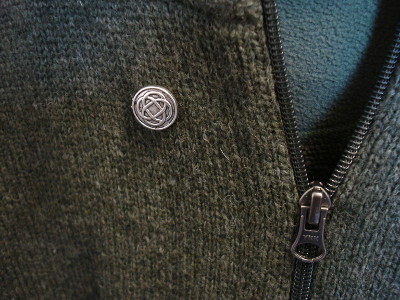 Unlike a traditional pin, the thickness of the clothing or material between the magnets matters a great deal. The clamping strength between two magnets depends on how far apart they are. In other words, magnets that work great on a thin cotton shirt might not hold at all on a thick sweater. Put another way: for thicker materials, you need to use bigger magnets to get the same desired strength. We did a few experiments here to see how this might translate into picking actual magnets. Let’s say that you have a pair of D81 disc magnets that are 1/2” diameter x 1/16” thick. Let's also say that you like how well two of them hold through one layer of your cotton shirt. Will they be strong enough through two layers? Through a sweater? Through a wool coat? Through both a tie and a shirt, as a tie-pin? Maybe not. The table below compares a few different 1/2" diameter magnet sizes. Bigger, stronger magnets are suggested for thicker materials. So far, we’ve been talking about using two magnets, where they attract towards each other from either side of the fabric. Can you use a magnet on one side and a piece of steel on the other? Sure, this can work. It can be less expensive, since you only need one magnet. A great example of this is found in our Magnetic Badge Holders. In fact, we’ve heard from a number of customers who have used these successfully for large brooches and even small corsages! Are there disadvantages to using one magnet and a piece of steel? Yes, some. When reaching across a distance, it can be weaker than using two magnets. If you have to use a larger single magnet to get the same strength, some of that cost savings goes away. Also, two magnets tend to attract to center on one another, which makes handling them nicer. This won’t happen with steel. A magnet can stick to any location along a piece of steel, and won’t necessarily center perfectly. The magnet is sewn into a pocket in the ribbon. 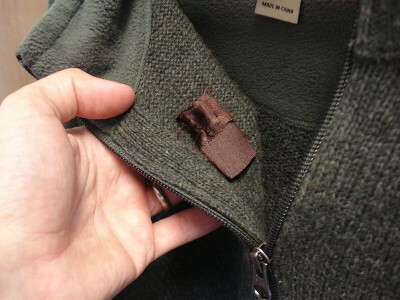 The magnet behind the sweater is easier to handle enclosed in the ribbon. Neodymium magnets are made of a hard, brittle material. They can be fragile, especially in thin shapes. If allowed to slam together, they can chip, crack or break. Make it easier to find the magnet if you drop it. 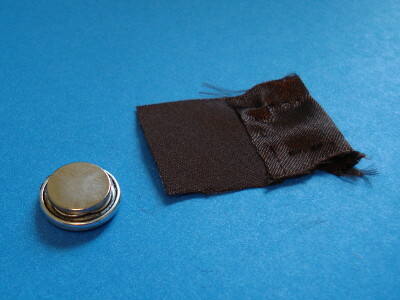 Our Sewing Magnets, previously featured as magnetic closures in clothing, also make great magnets for brooches. They’re strong, durable and thin. Made with a thin steel shell around a magnet, they are more durable than plain disc magnets. One downside of these magnets is that when you get them stuck together without anything between them, they can be quite difficult to separate from one another. The ribbon idea above is especially helpful in addressing this problem. Glue one of these magnet pairs to the back of your brooch, and enclose the other in ribbon for easy handling. How much weight can a magnet hold? What size do I need? What size magnet do you need for your particular pin or brooch? It depends. Our engineers can do a lot of math on this subject, but even their answers tend to be elusive. Is 1.2 lb of force good? Or 2.4? It's often difficult to equate these numbers to what feels right. Usually, the best way to figure this out is with a bit of trial and error. We don’t have a minimum order requirement, so you can order just a few magnets in a variety of sizes to figure out what works best. Below are some common choices. In making the brooches and pins for this article, we used 1/2”, 5/8” and 3/4” diameter discs. It’s not just in decorative pins and brooches where people are substituting magnets for pins. We hear from folks using magnets to hold on race numbers for running events and from horse competitions, where riders where a number “pinned” onto their jackets. Wow, this article really makes magnetic pins sound great. Are there any drawbacks at all? Yes. Will magnets replace the common pin? Probably not. We'll conclude with a few downsides that we know of. Old fashioned pins are stronger than the magnets used for brooches. Pins provide a stronger, more secure hold. In many cases, they can be as strong as the fabric itself! For very thick materials, magnets aren’t as practical. While magnets work well with a cotton shirt, we probably wouldn’t use magnets with a thick wool coat. Magnets are much more interesting, but they’re also more expensive than a safety pin. Especially with strong magnets, separating them can be challenging. The ribbon idea above helps make this easier, though. Strong magnets can also affect electronics. Strong magnets can affect the compass on your smartphone. If the wearer has a pacemaker, it can be disabled with a strong magnet. We wouldn’t recommend a magnetic brooch for anyone with such an implanted medical device. See our Pacemaker Safety article for more info on this topic.